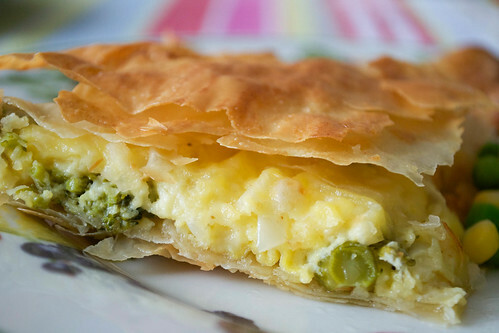 The idea for this recipe came when I was tucking into the Greek version of this pie, 'spanakopita', made with feta cheese, eggs and spinach and crisp filo pastry. It occurred to me, mid-bite, that it might be worth coming up with a British version, using home-grown ingredients instead. And so I did. This version uses Cheshire cheese, which has a milky flavour and crumbly texture, not unlike feta but obviously a bit less salty. I teamed it with Tenderstem broccoli and then of course good old filo pastry. I hope you enjoy. In a small frying pan, heat the olive oil and fry the onions, with a pinch of salt, until softened. Tip into a bowl and wipe the pan with kitchen towel. Add the broccoli and cover with water. Boil for about 5 minutes, until just tender. Plunge into cold water and slice in half lengthways. Leave to cool. Brush the bottom of a roasting dish with melted butter and lay over half a slice of the filo pastry. Brush over the butter again and add another layer of filo on top, until you have 4-5 layers. In a bowl, combine the grated cheese, cooled onion, broccoli and eggs and add a grinding of black pepper. Pour this over the filo and top with another layer of pastry. Brush with butter and then repeat, until the rest of the pastry has been used up. Brush with a final layer of butter and bake for 25-30 minutes in a 200ºC oven, until golden and crisp. Lovely. Excellent suggestion Dom, sounds great!